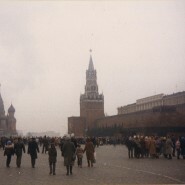 It is 1991, and I am sight-seeing around Moscow with Natasha, a fellow counselor from the Soviet Pioneer camp where I am working for the summer. Natasha is hoping that I, the American Jew, will be able to educate her about the religion of her ancestors. But I know almost as little about Judaism as she does. At the age of 19, my Jewish identity is nearly entirely negative. I would never have a Christmas tree in my house. I would never join a church. I would never wear a cross dangling from a gold chain around my neck. But I would probably have to think pretty long and hard to come up with something that I do do because I am Jewish. I have come to Russia as part of a Glasnost-inspired cultural exchange of camp counselors between the US and Soviet governments. Everywhere I go at my summer camp outside of Moscow the children point and yell “Amerikanka!” as though they are sighting Madonna or Michael Jackson or Paul Mccartney himself in the flesh. But it only takes a few days for me to start sensing that, in their eyes, the fact that I am Jewish is not exotic and glamorous like being an American. Judaism, in Russian eyes, is less like a religion, and more like a chronic, debilitating disease that they sincerely wish I could be cured of sometime very soon. I am the only out-of-the-closet Jew for miles around; and the anti-Semitism is palpable, even a bit threatening. I have never felt so distinctly Jewish in my whole life. And then Natasha and I see them coming from the other direction on Arbat Street. Three young men in black hats and black jackets. It can’t be, but it is; we are seeing real-life Orthodox Jews in the middle of Soviet Moscow! If I had seen one of these young men on the streets of my native Baltimore, I would have felt as different from him as I would from a Sikh cab driver wearing a neon yellow turban. But here, in Moscow, I feel as though I am about to be reunited with a long-lost twin from whom I was separated at birth. We make a beeline for them. “Hey there! What are you doing in Moscow?” They are stunned by my excited greeting. One of them answers that he has come from Brooklyn and his two friends from Australia in order to work at a Lubavitch summer camp for Jewish children. “I’m also working at a summer camp!” I am amazed by the coincidence. He mentions the name of a Jewish camp, and asks if I am working there. There are a few seconds of total silence. All three of them look at me as though I have just told them that I live on Venus and am planning to return there sometime real soon. Why are they reacting like that? I wonder. Don’t they realize that they are the ones who look like aliens here, not me? I am stunned by his gentle but powerful rebuke. One of the Australians scribbles down the phone number of the local Lubavitch synagogue and suggests that I could attend a class there. “Sorry, but we’ve got to run,” the one from Brooklyn apologizes, and I watch the three of them disappear as they rush down Arbat Street. I never saw them again, but this young man’s comment stuck with me for months and months. Back at the camp, I chewed on it when I woke up in the morning and when I went about my day and when I went to sleep again at night, like bitter bubble gum. When Natasha and I went to the synagogue two weeks later, it was filled to capacity. The European conference of Lubavitch rabbis, it turns out, was taking place that week in Moscow. In the women’s section, Natasha and I hold prayer books but instead of trying to decipher them, we gawk around us at our strange surroundings like country yokels staring up at Manhattan skyscrapers. I stand next to a young Russian Jewish woman who is praying in a loud determined whisper as she twists back and forth, her arm wrapped around her waist. Natasha asks me a question about the prayers, and I try to ask the woman next to us, but she just points at her prayer book and keeps on praying and twisting. I think about the fact that this woman was raised under Communism, and she has managed to learn so much about Judaism that she can pray with such impressive devotion from her prayer book. I was raised in America, and was allowed to learn about Judaism. So why is it that I am the one who feels more at home inside a church than a synagogue? It is difficult to pinpoint a moment that a life changes course. But that morning, in that synagogue, I believe, was one of those pivotal moments. At that moment, watching that woman, my heart started shifting, changing angle, altering orientation. There were many detours and stalled engines and uphill climbs along the way, but that fateful encounter on Arbat Street and that morning at the Lubavitch synagogue were the points of departure for a life-long journey towards leading a truly Jewish life that my husband and children and I are still on to this very day. Tomorrow is Gimmel Tamuz, the day when we pay tribute to the Lubavitcher Rebbe. The Rebbe, one of the greatest leaders the Jewish people has ever known, devoted his life to searching the world for lost Jews like me. A Jew who had spent her entire life walking along the edge of a cliff, with the Jewish world disappearing beyond the horizon to the left, and the shattered bones of millions of assimilated and intermarried Jews calling my name from the right, two miles down. The Rebbe and his Shluchim pulled me back from that cliff and pulled me back into the warm embrace of the Jewish people and the light of Torah. They pulled me back home again. Wow, your story is so touching…my husband was also brought back by Lubavitch, and even though not all my children call themselves Lubavitchers, they all cannot avoid the fact that without the Rebbe’s shluchim, who knows where they would be? May Hashem grant you the time and koyach to keep up YOUR holy work! This was so beautiful – I’m tearing up just now as I read it. This reminds me of Rabbi Nachmans parable which tells about the man who dreamed of treasure buried under a bridge in a faraway country. When he went to retrieve the treasure, he was stopped by a foreign guard who scoffed at his dream, telling the man that he, too, had the same dream, only the treasure was buried in a certain village under a certain house: describing the mans own home. He immediately returned home to find the treasure buried in his own cellar…. Thank you for sharing this personal story. You write so beautifully, I could see and feel what you were writing about and was very moved. The Rebbe’s message of Ahavas Yisroel is a powerful one, taught by example and his great leadership and love for every Jew. Ultimately, it is our uniting together as a proud Jewish nation keeping Torah and Mitzvos alive that will bring Moshiach TODAY! Mrs. Weisberg, your blog which is always so full of inspiration and mitzvos and is so respectful in content and language surely gives the Rebbe a lot of nachas.